LCARS 6.1 has been rolled out. There are a few unfinished areas which will be finished soon. So, if you see a few database modules with "no title", please bear with us. Among the changes, you can now full screen Stellar Cartography, more data files, a ton of spelling mistakes fixed and so on. Still working on the USS Excelsior and the Romulan computer files—most of the source files have been lost, but they should be available in the next version. 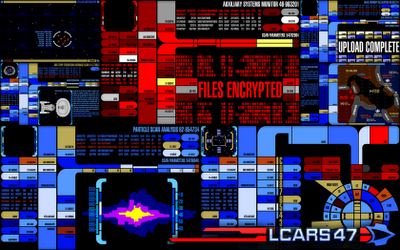 Please direct your browser to the current version of LCARS 47.